Almost a year ago, I got a phone call: mom had been admitted to hospital. Since she had been suffering from dementia for quite some time and living in long term care for over a year, it was not surprising. A friend offered to drive me to Collingwood to see her. We left quickly for the two-hour trip. I was tense. There had been significant family conflict in the past few years and I had not seen most of my relatives in a long time. Add that to the anxiety over my mother’s illness and I was not in good shape. T. and I travelled in silence until we reached the hospital parking lot. I took and deep breath and got out of the car, feeling shaky. I reminded myself of God’s constant presence. As I stood up and closed the door behind me, a small purple flower on the ground caught my eye. It was growing right beside our parking spot, in the dry and dusty gravel: lavender. Why it was growing there, I had no idea. How it could be alive in such a barren place was a mystery. Yet it could not have been a more perfect find at just the right moment. 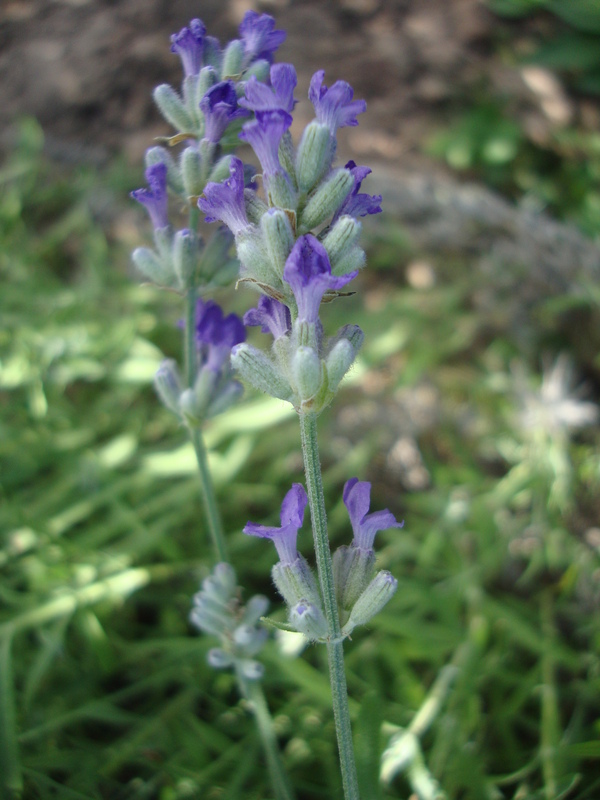 Lavender is known for its healing properties. It has been used for generations to calm the anxious, bring sleep to the restless and offer relief to those in pain. I have grown English lavender in a back corner of my backyard for years because it looks beautiful, but I also love the scent. I have a spray bottle of lavender water that I use when I’m changing the sheets. I love lavender scented soap, too. I bent down and picked three wands of the lavender flowers. I carried them, along with my mother’s childhood prayer book, into the hospital. I received the news that my mother had fluid in her lungs and was having trouble breathing. Although I didn’t know how long it would be, I did know that this signalled the end of my mother’s life journey. 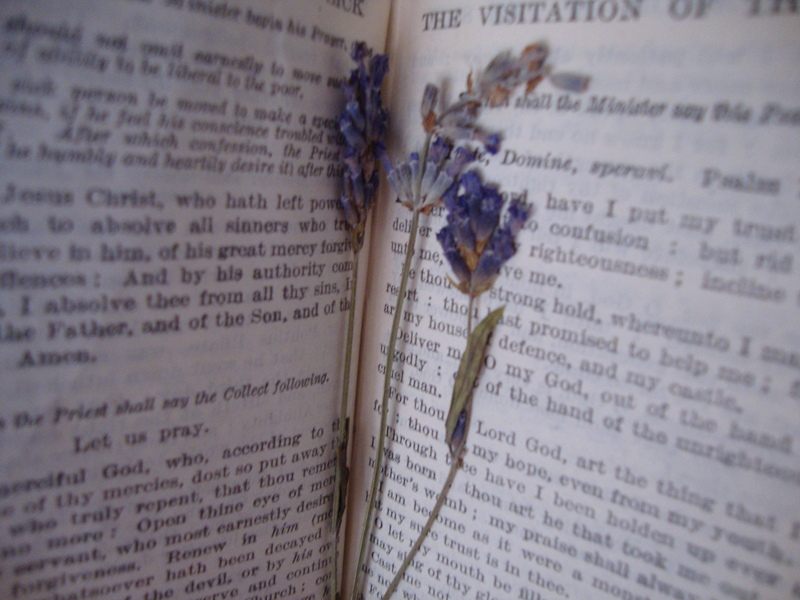 I sat at her bedside, the lavender still in my hand. I rubbed it between my fingers to release the sweet aroma. I read to her from her prayer book. I know that there are scientific studies going on to measure how scents like lavender affect our minds and bodies. But I didn’t need any official documentation. Those pretty purple blooms made me feel calmer and more relaxed in those grief-filled moments. They offered my mom the scent of something besides hospital chemicals as she made her journey from this world to the next. They added much-needed beauty and peace to our afternoon together. It was only a matter of days before my mother died. She passed on quietly, and although she was still so young–only 67–I was relieved for her after so much suffering. I was blessed to be present at that sacred moment when she slipped from this world into the next. My lavender blossoms were still in my hand. I kept those small, fragrant flowers. They are now pressed between the pages of my mother’s white prayer book, which sits on a shelf in my bedroom. The smell is gone from them but they have dried well, keeping their shape and their colour. I get them out and look at them from time to time, and they are a memento of my mother and our last few days. Those dried flowers are also a testament to the fact that sometimes beautiful gifts mysteriously appear just when we need them the most. This entry was posted in Uncategorized and tagged family, inspiration, lavender, life, nature, prayer. Bookmark the permalink.